Mandy Miller is a broken woman trying to keep everything together. She lost her will to love when a drunk driver took her husband and two children away from her. She is sick of all the sympathetic looks she gets in her hometown of Cottonwood Alabama, so she makes the drastic change and moves across the country to L.A to follow her dreams and become a lawyer. She thinks she finally has everything together and can leave her horrific past behind. That is until she meets her new assistant who turns her world upside down. Joshua Rodgers is new to town and is looking for a job to help him pay his way through Law School. He finds the perfect job as an assistant at one of the best law firms in L.A. Joshua quickly becomes smitten with his new boss and vows to never hurt her. But what happens when he is the very reason for her pain? Collin Morrow has 4 days before he is deployed back overseas. When the love of his life goes missing he has to choose between saving her or going AWOL… There is no choice he will save her at all cost. Sandra Jones finds herself broken and alone with no one to turn to for help when she needs it the most. She fights for life in this gripping tale of love and obsession. Can Collen save Sandra not only from her capture but from herself? Let me tell you a little bit about myself…. I am a true southern belle. I like my sweet tea and I like blessing hearts. I was born and raised in a one stop light town in North Alabama. As a child I was a bit of a tomboy. I loved riding bikes and playing basketball and volley ball. I have 2 younger sisters and although I never had a brother my older cousin was the closest thing to that than anyone. As a teen I loved to read. My favorite author was Lurlene McDaniel, I loved and still love all of her books. I think I have made it through all of them by now. Lol. Although I have added several authors to my favorites list I still enjoy her writing style. But she isn’t the reason I became an author. That is all my cousin LeAmbra’s fault. Y’all may know her better as Author Salice Rodgers. I had a dream one night about an unplanned and secrets filled relationship between a broken women and even more broken man and I asked Amber to write a book about it. She refused and said she wouldn’t write my story that I should. 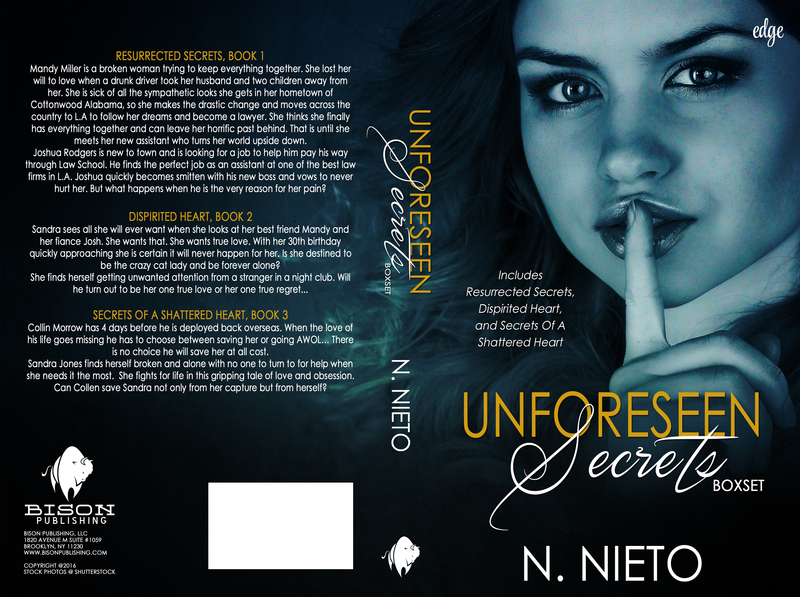 So that’s how Resurrected Secrets was born and Author N. Nieto. These days I spend my time chasing kids and cleaning house. I somehow find time to read and write in the middle of all of that crazy. I always say as long as one person likes my stories then it is worth it in the end for me. 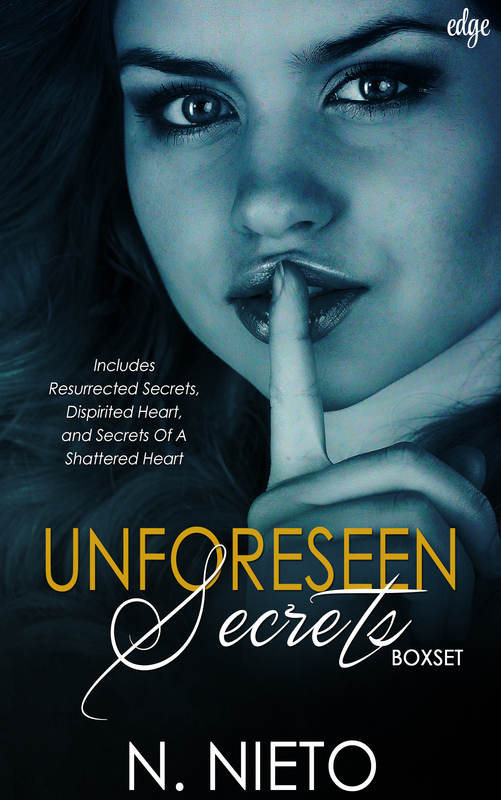 This entry was posted in Cover Reveal, Romance, Romantic Suspense and tagged book cover reveal, boxset, cover-reveal, n-nieto, romantic suspence, Unforeseen Secrets.